By blatantly copying disruptive pattern uniform, some central police organisations and even state forces have started comparing themselves with the Army. But their ethos and actions show that they have a long way to go. This picture flashed around the country would illustrate how ! 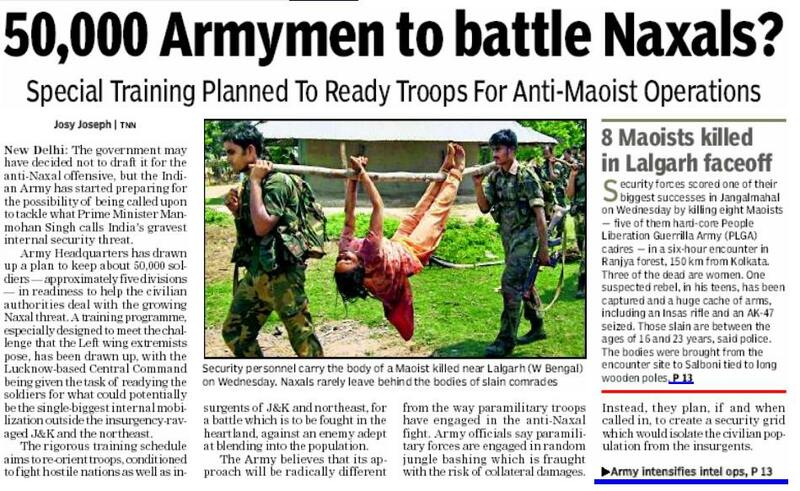 Though the public at large is totally with the Home Ministry in its resolve to tackle the Maoist epidemic, the way the enemy is treated differentiates an irregular militia from an Army, and these men in the picture prove that they are more of the former and none of the latter. The rules and rates for claiming TA for transportation of personal effects have been revised. The discussion on the same has remained quite heavy on the chat box and hence I thought of providing the link to the latest changes. The new letter issued by the Ministry of Finance on the subject can be accessed by clicking here. As regular readers would know, non-functional financial upgradation was implemented in the civil services after recommendations to the said effect by the 6th CPC. The said scheme essentially involves the grant of a higher grade pay (and pay band, if applicable) with two years’ difference vis-à-vis IAS officers of the same batch in conjunction with the central staffing scheme. For example, if an IAS officer is empanelled as Director to Govt of India in Pay-Band-4 with Grade Pay of Rs 8700 after 15 years of service, then other Group-A civil service officers would also be placed in Pay-Band-4 after 17 years of service on a non-functional basis, meaning thereby that they shall be granted higher pay but not status. Problems were however being faced by officers in the Junior Time Scale (Pay-Band-3 Grade Pay 5400) of some civil services since the empanellment of IAS officers is almost non-existent at the Senior Time Scale (STS) level (Pay-Band-3 Grade Pay 6600). Since hence there is no point of comparison at STS level, the govt has decided to grant Grade Pay of Rs 6600 on a non-functional basis to all those Group-A officers of the organized civil services who complete 7 years in Group-A. The letter issued by the govt can be accessed by clicking here. This is grossly misleading, and for three compelling reasons, departmental action should be taken against the person who prepared the Defence Minister’s speech. Firstly, Constant Attendant Allowance (CAA) is nothing new and has been in force since times immemorial, it has merely been enhanced from the earlier Rs 600 per month to Rs 3000 per month w.e.f 01-01-2006 by the 6th CPC by way of its recommendations presented way back in March 2008. The defence ministry or the govt had no role to play in this enhancement which anyway is stale news and our Minister is late by some years in getting to know about it. Even otherwise, the amount is totally inadequate since no full time attendant can be hired in Rs 3000 which is less than even the prescribed minimum wages. Secondly, it has nothing to do with the ‘valour’ or ‘sacrifice’ by ‘army’ personnel since it is available across the board to civil central govt employees as well. Thirdly, it is not available to all disabled personnel but only to those who are 100% disabled. This is another example as to how lower level bureaucracy has managed to convince even the political executive about this non-existent imaginary benevolence. Those who have touted this to the media as an ‘announcement’ should definitely face the music for misguiding the Minister and misleading the media and the public at large. Widows are entitled to two family pensions only if one of the family pensions is under a contributory scheme. Two proper family pensions from the government under non-contributory schemes are not admissible. Such injuries are battle casualties for financial purposes and physical casualties for statistical purposes in accordance with corrigendum to SAO 8/S/85 issued on 15 May 1991. Totally incorrect. When there is negligence on part of an individual, the disability element can be reduced but not refused. Please refer to Regulation 175 of the Pension Regulations. You are authorised War-Injury Pension and not regular Disability Pension. Please refer to Para 10.1 of MoD letter dated 31 Jan 2001 on the subject. ‘Boy’ service has to be counted towards pension vide MoD letter No 1034/C/02-D (Pen/Sers) dated 10 Oct 2003. Even the Hon’ble Supreme Court has ruled the same. Kindly quote the ibid letter to your Records Office and they shall do the needful. Endorse a copy of your representation to the office of PCDA(P) Allahabad also.